U.S. stocks finished at session highs on Friday, pushing the S&P 500 higher for a second day, to cap its best week since July 17th. Equity markets ended a volatile week, with wide swings, as investors wrestle with uncertainty ahead of this week Federal Reserve policy decision on interest rates due out on Thursday. In notable post-Labor Day economic data, Wednesday's Job Openings and Labor Turnover Summary (JOLTS) from the U.S. Bureau of Labor Statistics showed job openings surged in July, rising to 5.753 million from an upwardly revised 5.323 million in June. 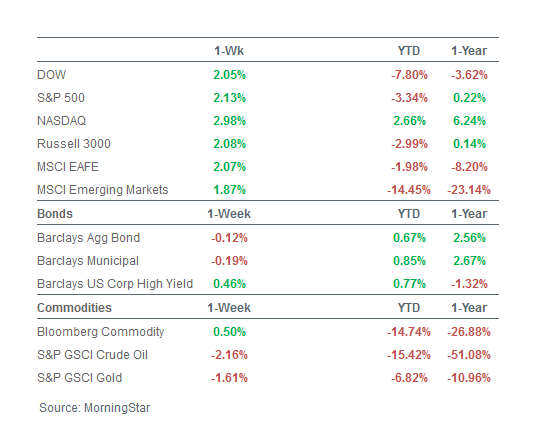 For the week, the S&P 500 rose +2.13%; The Dow Industrials gained +2.05%, EAFE (developed international) added 2.07%. There have been 19 corrections since WWII. Following the latest, the S&P 500 has slightly recovered off of the 12.4% decline from its most recent peak and now trades 7.9% below its May 21 all-time high. History says, however, that the worst may not be over, as Septembers typically show an additional decline of about 4% after the market was down more than 5% in August. 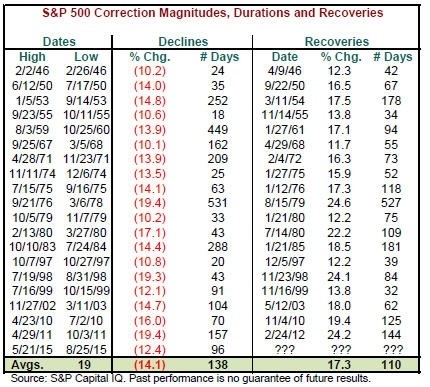 Plus, the time between corrections implies that the S&P 500, historically, needs to decline even further to reset the dials after such a lengthy advance between 10%+ declines, according to S&P Capital IQ. Add to these the projected 3.8% decline in 3Q S&P 500 operating EPS, and the resurrected possibility that the Fed may begin its rate-tightening cycle at its upcoming September 16-17 FOMC meeting, and we see that the possibility exists for a further re-test.